Intel is launching a new Crimson Canyon NUC in September, powered by its elusive 10nm Cannon Lake i3 8121U chip. 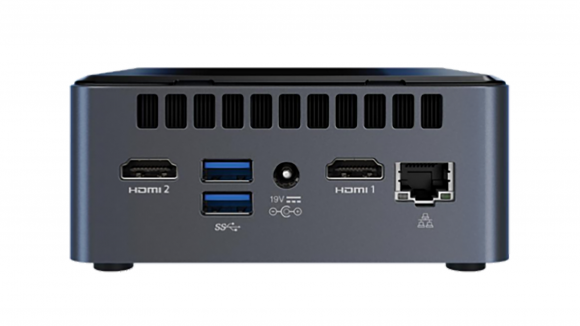 Intel are yet again teaming up with AMD on its latest NUC model, however instead of an on-package solution, such as Kaby Lake G, the Crimson Canyon NUC will feature a discrete AMD Radeon 540 GPU. The Crimson Canyon NUC comes in a miniscule 102 x 102 x 51mm package. There’s still active cooling enough to keep the dual-core HyperThreaded Cannon Lake chip cool, but with just a 2.2GHz base clock and 3.2GHz boost clock, amounting to a 15W TDP, it’s not going to be generating all that much heat compared to its bigger Hades Canyon NUC sibling. And neither will the Radeon 540 create too much heat with its paltry eight compute units (CUs), either. For the record, the RX 580 features a total of 36 CUs drawing roughly 185 watts of power from the PSU, while the RX 540 draws just 50W. That should also give you a rough idea of the performance you might expect from the mobile Polaris GPU. But even if the GPU isn’t capable of much in the way of gaming performance, it still tops Intel’s integrated graphics solution – which, in a perfect world, may have been Intel’s preferred option. However, Intel’s in a bit of a tight spot, and has been forced to side with a competitor yet again. Intel’s Cannon Lake is built upon the 10nm lithography, which has caused Intel a massive headache for many years now. The tech company even had to sacrifice integrated graphics in the i3 8121U to actually get the Cannon Lake chip out of 10nm production hell and into PCs by the end of 2018. If not only as a token effort to investors. But despite the reported low yields and die shrink nightmare that is 10nm, Intel has found some use for its dual-core iGPU-less Cannon Lake chip. 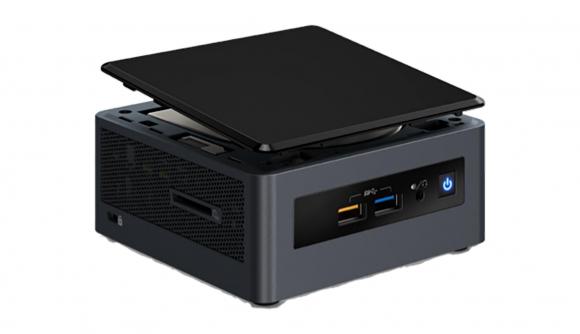 As Liliputing reports, the Crimson Canyon NUC will launch in September with either 8GB or 4GB of LPDDR4 memory, space for a 2.5-inch SATA HDD, Intel Optane support, and a heap of USB and HDMI connectivity. While it won’t be a gaming machine for the likes of you and me, it is at least expected to be a damn sight cheaper than its Kaby Lake G compadres, starting at $529.